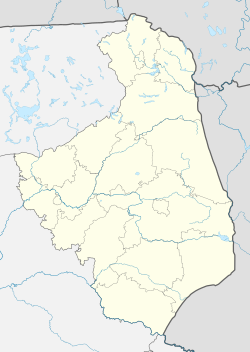 Zambrów [ˈzambruf] ( listen) is a town in northeastern Poland with 22,933 inhabitants (2003). It is the capital of Zambrów County. Situated in the Podlaskie Voivodeship (since 1999), previously in Łomża Voivodeship (1975–1998). 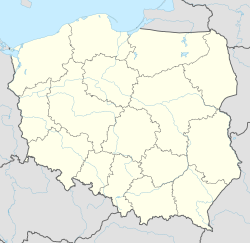 The name of the town comes from the term ząbr, which means a place where żubry (European bison) gather. The first mention of the town comes from 1283. Back then the town was the property of the Masovian Dukes, and it got its city laws (Chełm law) in 1430. The greatest development of the city came during the 15th and 16th centuries. The Swedish Deluge brought an end to the prosperity of the city as much of it was destroyed. During both the January and November Uprising against Russia, the area was witness to battles against Russian forces, and as a result of persecutions by the Tsarist regime, the city was deprived of its city rights in 1870, and two Russian regiments of infantry were stationed in the town. Throughout World War I the area again faced much destruction. The Polish 1st Legion's Infantry Regiment under the command of Edward Rydz-Śmigły was stationed in the town during 1917. After Poland regained its independence, city rights were restored in 1919. During the inter-war years the city was linked to the military: the 71st Infantry Regiment was stationed there and the town was home to a military school. In 1939 the population of the town was over 7,000 people, over half of them Jews - many of whom had populated the town in the late 19th century from neighboring Jewish communities in the Łomża gubernya, such as Jablonka Koscielna. Between the 10 and 13 September the area was the fighting ground of the Polish 18th Infantry Division commanded by Colonel Stefan Kossecki and German XIX Panzer Corps under the command of General Guderian. Polish soldiers from the 33rd, 71st, and 42nd Infantry regiments were taken prisoner. They were then taken to the square to the city barracks, then used for exercises. On September 13, 1939 the number of Polish PoWs was about 4,000. In the corners of the square machine guns were put on cars, and behind them horses were kept that belonged to the Polish unit. During the whole night light reflectors were beamed upon the square. On the nights of the 13th and 14 September when Polish prisoners started to lie down to sleep, the German captors informed them that anybody that on that night who tried to rise or move from his place would be shot on the spot. After that information horses stormed the square, trampling the sleeping soldiers on the ground. In panic many Poles tried to escape, but the Germans immediately opened fire with machine guns into the crowd: this lasted over 10 minutes and ended only when some German soldiers were wounded by mistake. When the shooting stopped, the Germans again informed the Polish POWs that no movement was allowed. During the whole night wounded and dying were crying for help, but no medical assistance was given. In the morning there were 200 dead and 100 wounded. According to the witness reports the horses were either driven by the Germans or blinded by the reflector lights. During the occupation a ghetto was established for the Zambrów Jews by German authorities. At that time the Germans killed 800 Jews in the city, including community dignitaries, at the Glmbokih forest nearby. Jews were transferred to the city's ghetto from Moisokh Mazowiecki. At the beginning of September 1941 hundreds of Jews found "unfit for work", including the elderly and pregnant women, were killed at the nearby Rothke-Koski woods. In the second half of 1942 the city's ghetto accepted Jews from Czyżew, and they were employed as forced labor. In early November 1942 al the residents of the ghetto were transferred to an abandoned military camp, where some 14,000 to 17,000 Jews from the environment were concentrated in very harsh living conditions. In January 1943, all of them were sent to Auschwitz death camp, while 500 to 800 Jews were murdered during the action and all the rest perished in the gas chambers. When the war ended the population of the town was 4,130 out of 7,620. According to rough estimates, war destruction reached the level of 43 percent. Szymon Datner Zbrodnie Wehrmachtu na jeńcach wojennych w II wojnie światowej 1961. Wikimedia Commons has media related to Zambrów. This page was last edited on 25 March 2019, at 22:01 (UTC).